For fans of crowd pleasing the Intouchables (2011), a massive hit about the friendship between a white millionaire and black ex-con. Set in Paris with sub-titles, the notion of the film being remade so soon was not on the cards, but the action has been moved from Paris to New York in The Upside directed by Neil Burger (Divergent), starring Kevin Hart as burglar Dell Scott. Dell needs job as a condition of his parole, he ends up as a caregiver, when the job he applied for as a Janitor is listed wrongly. 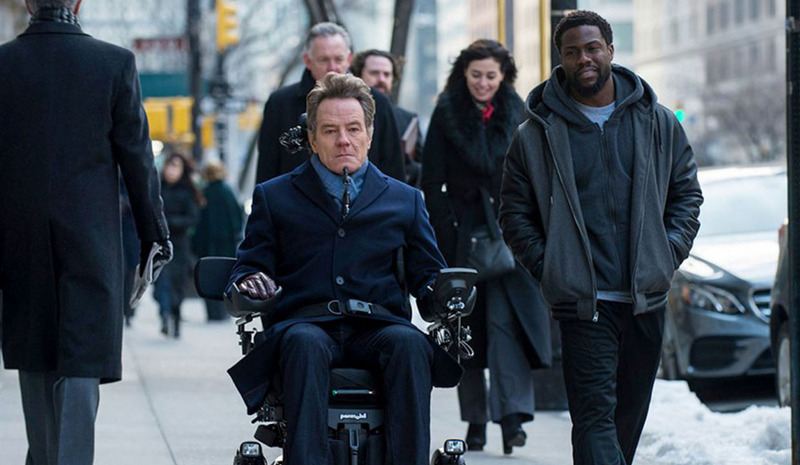 Hence the unlikely pairing with wheelchair bound and life-not-worth -living Phillip Lacasse (Bryan Cranston). Apparently the film is about to knock Aquaman of the No 1 spot in the US box office according to opening figures. The Upside is out in UK cinemas from today 11th January.